This collection of twenty-six black-and-white photographs, explores the textures, markings, and interplay of graphic elements found on city streets. These elements are manhole covers, cracks, oil spills, white paint from the Department of Highways, tire marks, footprints, tar, snow, and salt deposits. Randomly combined, they form a unique aesthetic. I like to believe that visual patterns, like good poems, contain secrets—a form of hieroglyphics, that if decoded, would provide insight into life’s mysteries and shed light into our lives. So I wonder what messages are embedded in these random patterns? Does what appear on street surfaces as haphazard actually mirror (and a road map to) our collective unconscious? The stunning graphics in street art are offered for their remarkable compositions, rivaling the best abstract art adorning the world’s finest museums. 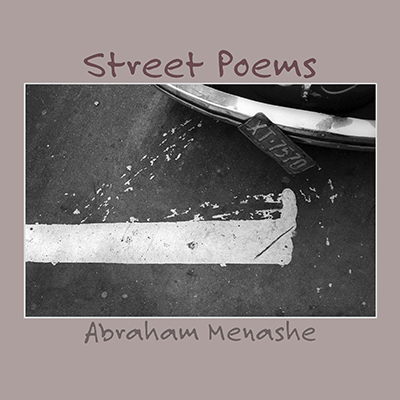 Street Poems, by Abraham Menashe, available from iTunes. ←Older: What is intimacy to you?